Multiverse theory suggests that all possibilities exist in infinite parallel universes. In some glitch of an alternate Earth, Super Bowl XXV saw the Buffalo Bills’ Scott Norwood miss a field goal as time expired, securing a hard-fought win for the opposing Buffalo Bills. The Super Bowl Champion Bills fought through a viscous playoffs schedule, defeating the Buffalo Bills and then the Buffalo Bills before finally besting the NFC Champion Buffalo Bills. Thanks to @JoeStraatmann for the image and general info. No, this isn’t one of Jim Kelly‘s fever dreams. And you don’t need to surf spacetime to see 8 Buffalos vie for football supremacy. The Buffalo-only playoff bracket is a Tecmo Super Bowl glitch. 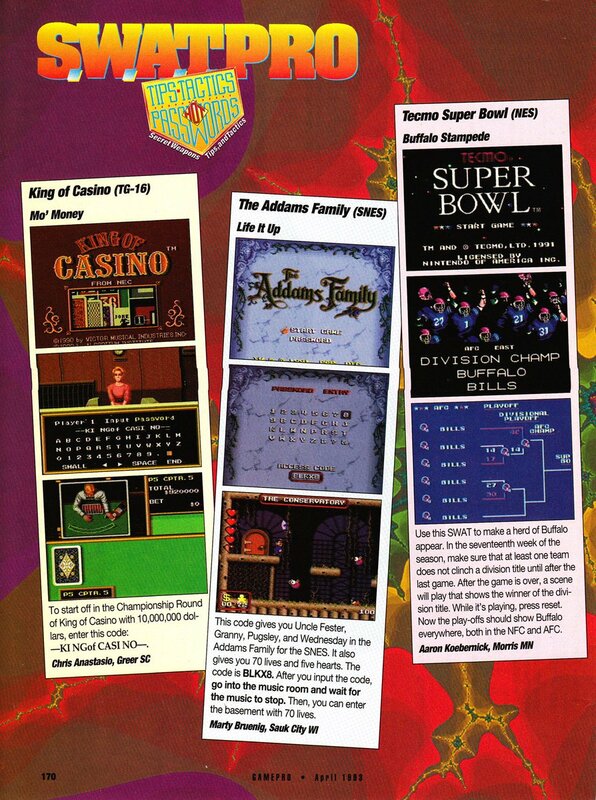 In April of 1993, GamePro Magazine posted a curious screenshot, one showing a TSB playoff bracket populated entirely by Buffalo Bills. The accompanying text claimed one could trigger the glitch by ensuring at least one division came down to the very last game of the season, then resetting the NES deck during the ensuing Division Champion screen. As our collective memory of GamePro faded, tales of the Bills Playoff glitch morphed. Fans asserted the glitch required a tie atop each division. YouTube user SuperHenryJones, remembering this “tied divisions” iteration of the Buffalo glitch, recorded a video to test the hypothesis. Though putting multiple teams atop each division is needlessly complex, the end result is the same: all Buffalo, all the time! The 8 Buffalos Glitch boils down to forcing the game to advance to the playoffs without choosing any playoff teams. First, each team in TSB is given a numerical value. The Bills, being the first team on the team select screen (and the rumored favorite of the TSB programmers) are given the first slot at value 0. Second, whenever something “happens” in TSB–say your player gets injured, or the season schedule advances from Week 1 to Week 2—the game sets a “flag” in memory. Flags keep track of game events so you can save and come back later. After the final game of the regular season, the game checks that each division has a champion and then sets a flag to indicate the season is ended and the playoffs are starting. In blackout before TSB shows the divisional standings, the game sets flags to indicate which teams have made the playoffs. Now, if any division depends on the Green Bay/Minnesota game at the end of the season, instead of going to the Division Standings screens (and storing the playoff teams to memory), TSB instead shows a “Division Champs!” cutscene. At this point, the game has ensured all divisions have champions and set the “playoffs” flag. However, it has yet to flag its playoff teams. So resetting during the “Division Champs!” cutscene will push TSB into the playoffs with a playoff roster full of zeros: The Buffalo friggin’ Bills. The 8 Buffalos Glitch comes with a few catches. First, if more than one division is decided by the GB/MIN game, the player must reset during the final Division Champs screen. TSB checks that each division has been won before setting the playoff start flag. Resetting the game before final “Division Champs” screen will put the player back in Wk.17 with the GB/MIN game yet to be played. Conversely, if all the divisions are decided before the GB/MIN finale and the season is in Skip Mode, resetting just as the screen goes black after the final score is shown will wipe out all season data and send the player back to Week 1. The reasoning here is slightly more complex, but essentially resetting at this point causes a memory error. So no, contrary to countless bulletin board postings, TSB players needn’t bother with ties atop every division. Just so long as the GB/MIN game at the end of Week 17 decides at least one division title, players can hit reset after the playoffs start, but before the teams are chosen, giving rise to QB Bills’ dream: Bruce Smith vs Thurman Thomas in the Super Bowl. But if you do happen to stumble on a multiverse wormhole, let me know; I wouldn’t mind living in a world where Art Modell never moved the Browns to Baltimore. Keith Good is a future Pulitzer Prize-winning novelist and 8-bit game geek. A perpetual optimist, he convinces himself every September that this could finally be the Cleveland Browns' year. He was once told to eff off by one of the Tecmo Browns. You can check out his other work at www.keithisgood.com and follow him on twitter @keithisgood. This entry was posted in Tecmo Super Bowl and tagged 8 Bills Glitch, 8 Buffalos Glitch, Buffalo Glitch, glitches, tecmo super bowl, TSB.